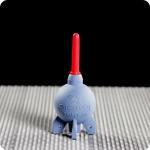 Click here to find correct swab size for your camera. ECLIPSE Optic Cleaning Fluid is the highest purity sensor cleaner available. E Wipe Professional-Individual Optical mirror and lens wipes. When used as directed, e-wipes are safe to use on monochrome CCDs, scanners, optical mirrors and other sensitive electronic and photographic image-forming surfaces. 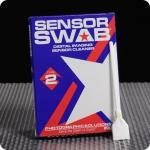 SENSOR SWABS are designed for cleaning CCD chips and other delicate or hard to reach optical and imaging surfaces. From PHOTOGRAPHIC SOLUTIONS, the inventors and industry leading sensor cleaning company comes a whole new way to check your sensor during AND after cleaning! Sensor Check® helps you clean any dust and debris on your camera Sensor helping you eliminate the need to digitally remove dust and spots from your images. The 5x power Sensor Check rests comfortably inside the camera lens opening and has an adjustable focus for different size cameras and sensor depths. Two different diameter settings fit most DSLR’s. Sensor Check’s unique lens design allows it to pivot 45 degrees so it can be swung away from the sensor chamber giving instant and easy access to the Sensor – while still utilizing the six bright LED’s during cleaning. 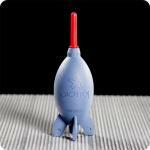 It is small and light (under 2 ozs / 55gms) so it easily fits inside your camera bag. 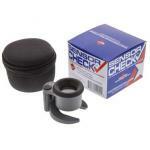 Sensor Check is available NOW and comes with two CR2032 batteries and a nylon zippered pouch.